(Jerusalem cowslip) Low-growing perennial, native to deep woodlands, formed with deep green lanceolate leaves speckled with white spots. Early in the season, blue flowers appear, changing into a variety of pinks and purples as the season goes on. As its name suggests, this relaxing expectorant has been valued medicinally for treating respiratory conditions and infections, soothing irritated mucous membranes through its mucilaginous agents. 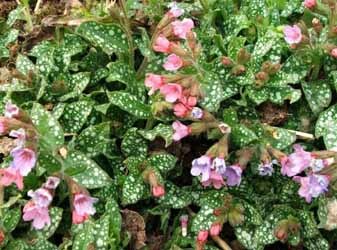 In fact, it was the speckled, lung like resemblance of the leaves that first led early herbalists to seek it out for respiratory complaints. Flowering tops are astringent and have been used to treat respiratory, gastro-intestinal and urinary conditions. Young leaves may be eaten raw or cooked, ideally added to salads or soups as they are quite bland on their own. Its fiber content adds nutritional value. Plant in shady and moist location, ideally under a tree.